Main diesel engine from 1965 made by ANGLO BELGIUM COMPANY - TYPE 3MDX - Cylindrée: 45 litres a été posé en 1993. According to the owner, around 4000 hours since 1993. Cons. 10 l/h at 10 km/h or 450 Rev/min. Max speed, 15 km/h at 650 Rev/mn. Le démarrage du moteur est à Air Comprimé. Un compresseur de 30 bars triphasé 380 V alimente la bouteille 250 litres - (Bouteille posée en 2015, prochain contrôle en 2025). une hélice de rechange en zamac. Deux parcs de batteries de 700 A/h avec répartiteur alimentent les servitudes. Deux panneaux solaires et un chargeur 24 V sont reliés aux batteries. un convertisseur Victron Phoenix 24 /1200. un groupe électrogène HATZ de 6 KVA. Interior completely transformed by our current owners as a live aboard barge and artist workshop. The boat also cruises regularly. From the terrace access into the interior with first, access to the artist workshop (around 30m2 with huge headroom of 3.10m) and then the living area. A huge galley and cosy saloon with a wood burner stove. Next comes the accommodation area. 3 cabins, on port side a double cabin with a 160x200m double bed and starboard, 2 cabins (one with 2 single beds) and another one used as an office. Also an utility room, a bathroom, heads. From the wheelhouse, one can access the aft boatman's cabin with a double bed (140x200) ensuite heads and shower (macerator heads). Heating through radiators (diesel fired central heating) plus, the wood burner stove in saloon. Hot water by a gaz heater and a 150L tank capacity. A generator (HATZ, 6 KVA) used during the cruises. Great deck terrace, to entertain and also the main access to the interior. Manual windlass for the 250kg stern anchor and its 80m of cables. 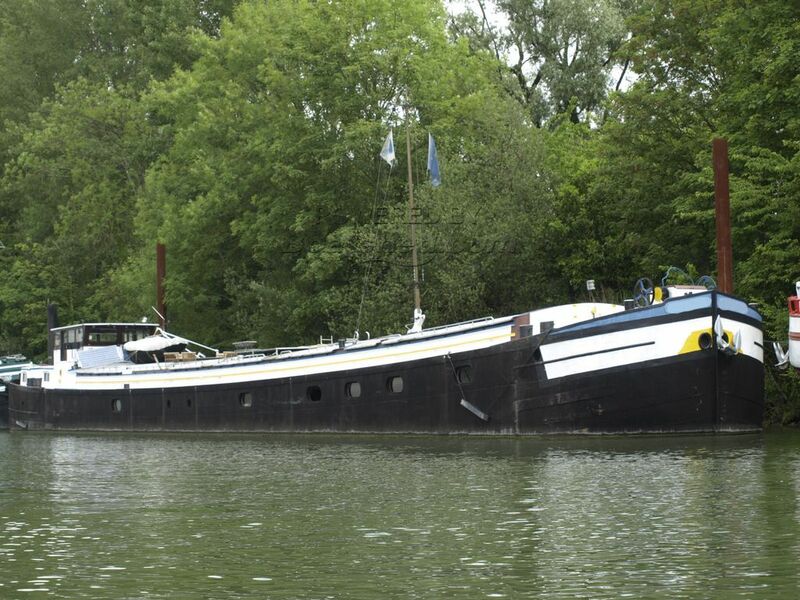 A live aboard and cruising barge for sale in France. Boatshed Paris is happy to offer this Freycinet barge type and still cruising regularly boat for sale in South Paris area. Also a 30m2 workshop for an artist or someone with the need of space to work. Transformed by our current owners to their needs, they have succeeded to keep the traditional boat lines as original, and created a cosy and comfortable interior for their family. They also kept everything to allow the boat to cruise including the wonderful slow revving ABC main engine. 3 to 4 cabins according to your need, an ideal barge for a family life style in comfort. Also, the collapsable wheelhouse will allow the access to the rivers or canals with low airdraft. Moored in the River Seine, only 20mn away form Paris Center, easy access by RER and located into a quiet and residential area with all commodities. This Peniche Freycinet Residential Barge & Cruising Home has been personally photographed and viewed by pascal gaetan of Boatshed Paris. Click here for contact details.